Grace College & Seminary honors former president Manahan with “A Leader’s Legacy” Mosaic at the Manahan Orthopaedic Capital Center. Pictured (from left to right): Grace College & Seminary President, Bill Katip, former Grace College & Seminary President, Ron Manahan, Barbara Manahan, Christi Ziebarth, and Tim Ziebarth. 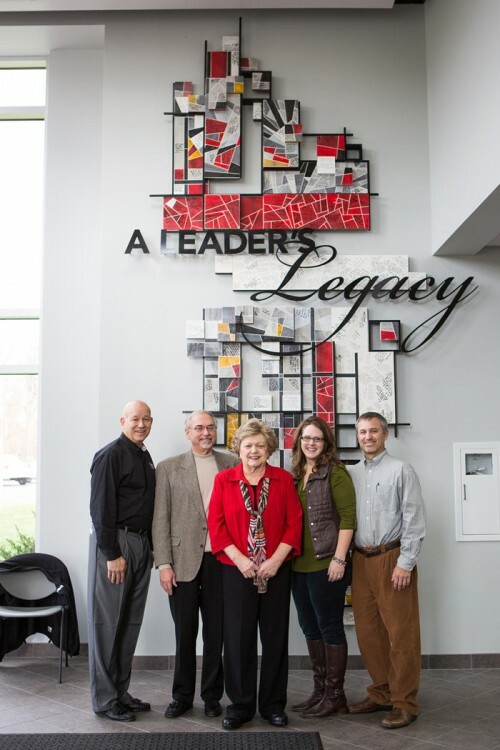 Ron and Barbara Manahan were honored by Grace College and Seminary faculty and staff on November 18 as an art piece was presented in their honor. Dr. Manahan recently stepped down after serving as the school’s president for the last 20 years. Reflective of the Frank Lloyd Wright style, the 10-foot by 4-foot acrylic mosaic was designed by Grace College graduate Christi Ziebarth and is comprised of 50 individually handcrafted pieces signed with well wishes by students, faculty, staff and community members. Entitled “A Leader’s Legacy” to commemorate Manahan’s service to the institution and the community, the piece hangs in the newly renamed Ronald E. and Barbara J. Manahan Orthopaedic Capital Center. Bill Katip, current Grace College and Seminary president, gave opening remarks and thanked those involved in the project, including Rod Nissley, Jeremy Hammer, and Keith Denlinger for the installation, Brandpoet staff for the lettering design work, Rhonda Raber for her project management, the student affairs staff for helping secure student signatures, and the staff and faculty who signed the pieces. Roger Peugh, campus prayer coordinator with many years of service to Grace College, gave a short devotional. Dr. and Mrs. Manahan were extremely grateful for the gift. “It will be a wonderful reminder of all who have been a part of our lives,” Dr. Manahan explained.